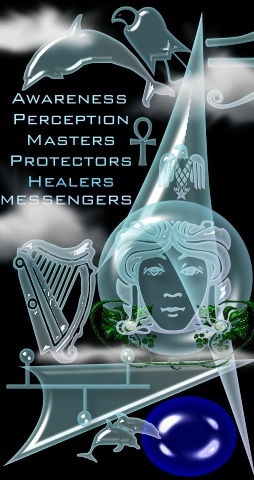 Messengers help us to fine tune our inner perceptions so that we can easily receive the spiritual counseling, advice, inspirations, visions, symbols and messages received from the spirit world. Teacher Guides are often regarded as Messengers since they only come to help us with a certain lesson or subject then move on to help others. Light Beings are also messengers. They come to us as beams or sparks of light, bring a particular message, then also move on. Message bearers help us find information, either by giving it to us directly or by leading us to a reliable source. Quite often, psychic readers and healers tap the information given to them by Messenger Guides to help others during a reading or healing session. Make it a frequent practice to sit, relax, drift into an alpha state, and attune to your guides. Pay attention to any message you receive - don't dismiss anything, even if it seems insignificant or ridiculous. In time, the meaning of the message will be revealed to you. Sometimes this realization is immediate, but most times, it comes at the perfect moment. It seems magical. You can also receive messages from your spirit guides through automatic writing. We can also receive messages in our dreams. Take a journal with you to bed, place it close at hand so you can reach it without shifting your waking position and record your dreams immediately upon awakening. Notice what symbols show up, what themes predominant, and what direct and subtle messages shine through. Writing these down gives you a running record of the continous stream of messages given each day by our guides.